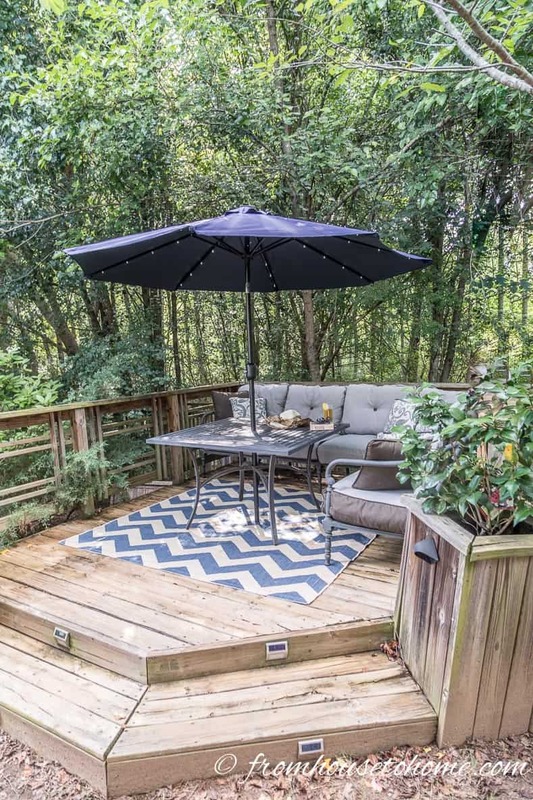 Just because you have a tiny deck doesn’t mean you can’t enjoy outdoor living. 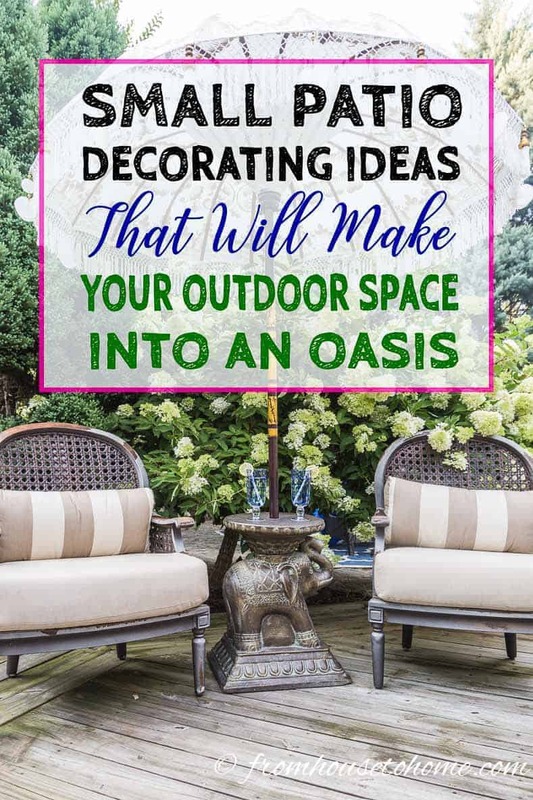 Use these space-saving tips and small patio decorating ideas to create an outdoor oasis out of whatever space you have. 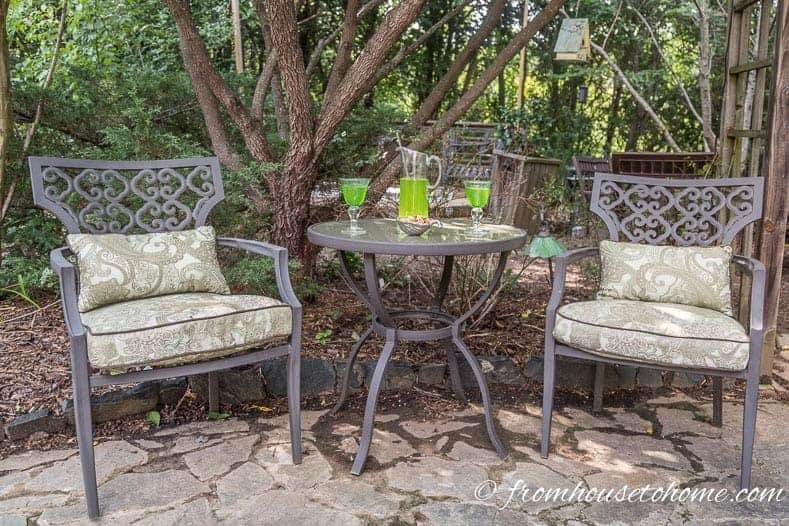 If you are like me, the best part of summer is relaxing on an outdoor patio with a couple of friends and a cool refreshing drink and feeling like you don’t have a care in the world. No matter where I have lived, even in apartments, I have always wanted to have at least a little bit of outdoor space where I could go to unwind when the weather is nice. 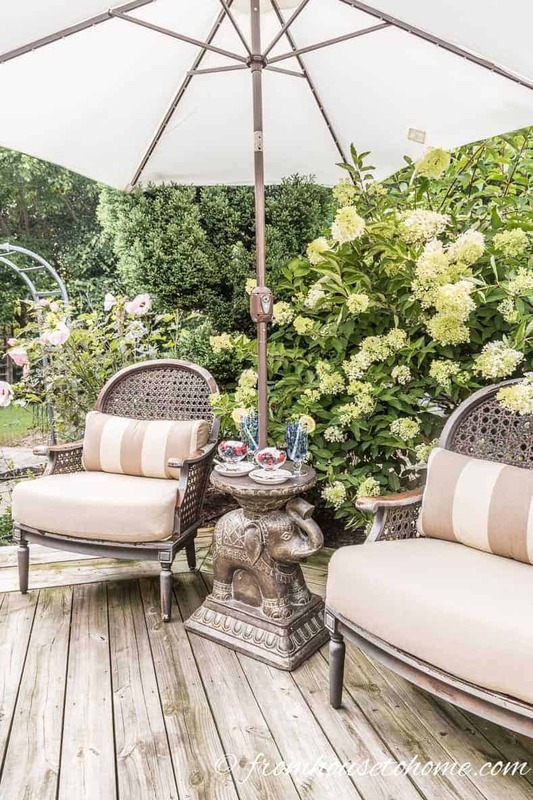 Since I’m a city girl, however, most of the places I have lived haven’t had a lot of room for large decks or patios. 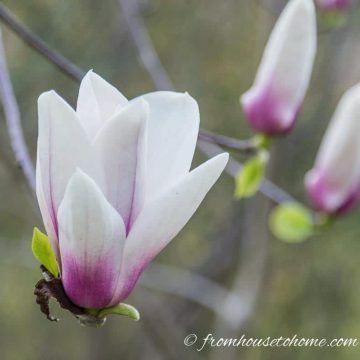 And I always felt like those small and crowded outdoor spaces cramped my outdoor living style. So when I moved into my current house (which was brand new and didn’t have anything in the back yard), I decided to build a deck and patio that would be big enough to handle all of my entertaining needs. And it does. But you know what else I found? A really large open area feels really big and empty when you don’t have a lot of people around (which is most of the time!) 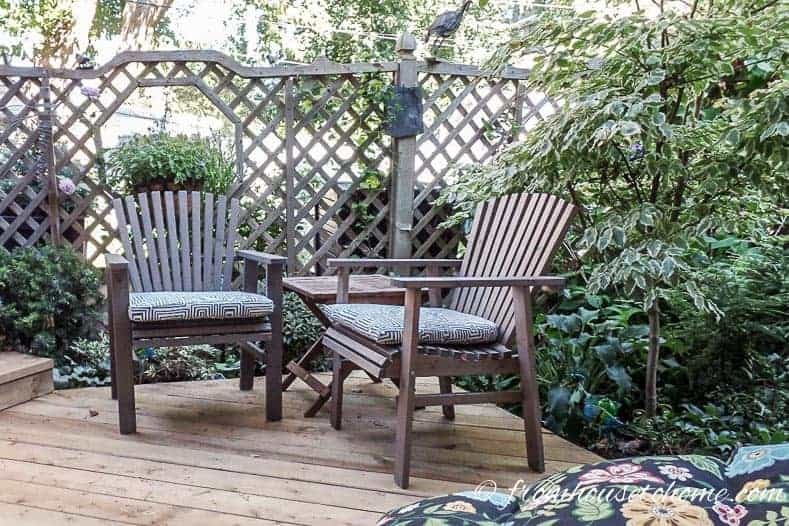 I came to the realization that smaller patios and decks are more cozy and inviting. 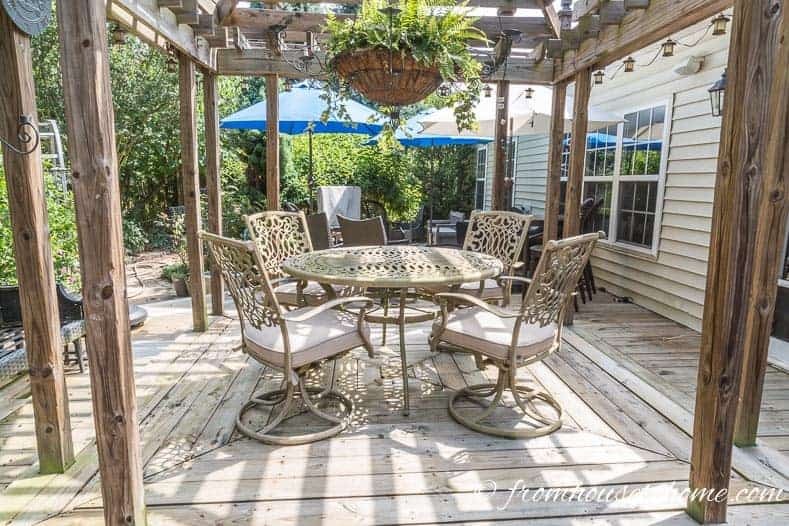 And so, inside of my big outdoor living area, I now have many small spaces that require the same kind of small patio decorating ideas that my old city ones did. 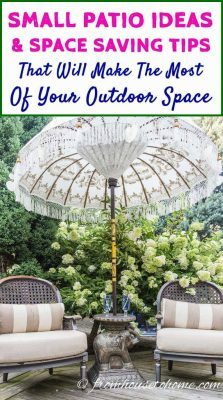 I thought I would share some of my space-saving tips and small patio ideas that help make the most of the space you have. 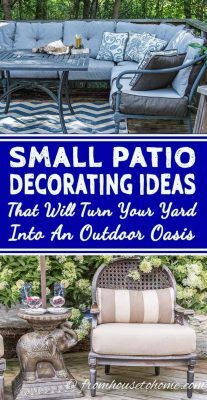 First up on my list of small patio decorating ideas is carefully choose how you place the seating. 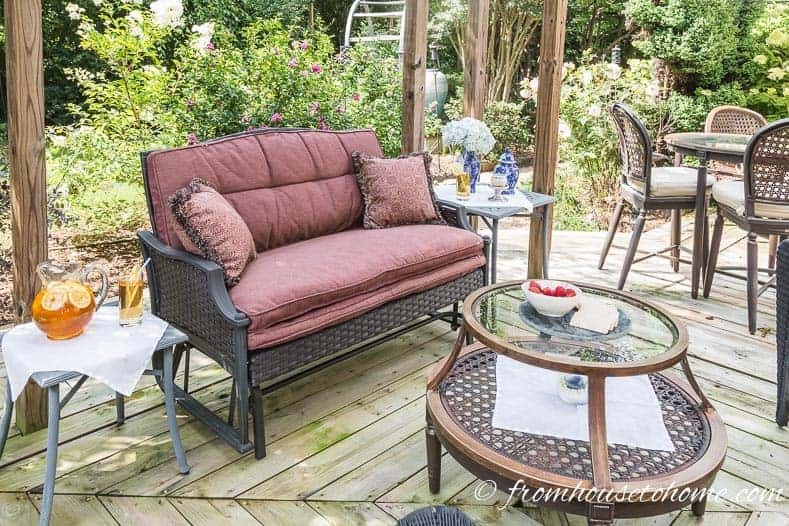 Whether you build in benches or buy a sectional outdoor sofa, arranging the seating around the edges of the patio (or deck) will give you more usable space. I know this totally goes against one my decorating rules of pulling furniture away from the walls…but sometimes you have to break the rules! 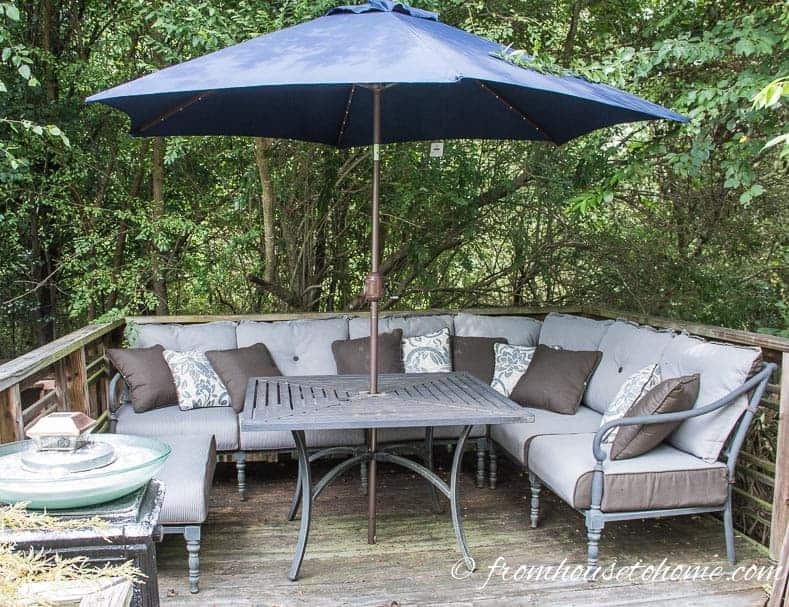 For the small deck at the back of my yard, I was lucky enough to find an outdoor sectional sofa that fit into the two sides perfectly. 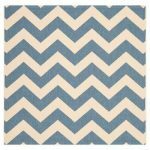 Adding a square table makes it perfect for using as a dining space, like I did for my 4th of July party. 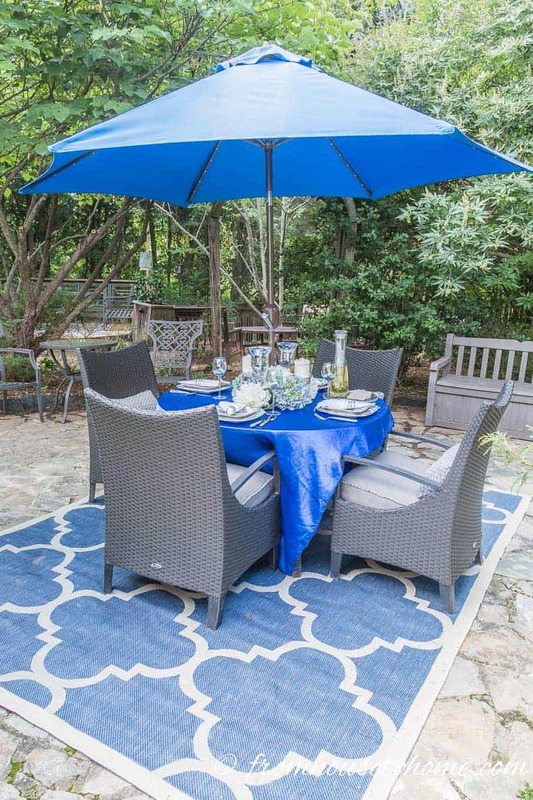 Another of my small patio decorating ideas is to use outdoor area rugs. They’re meant to take the weather and usually aren’t that expensive. 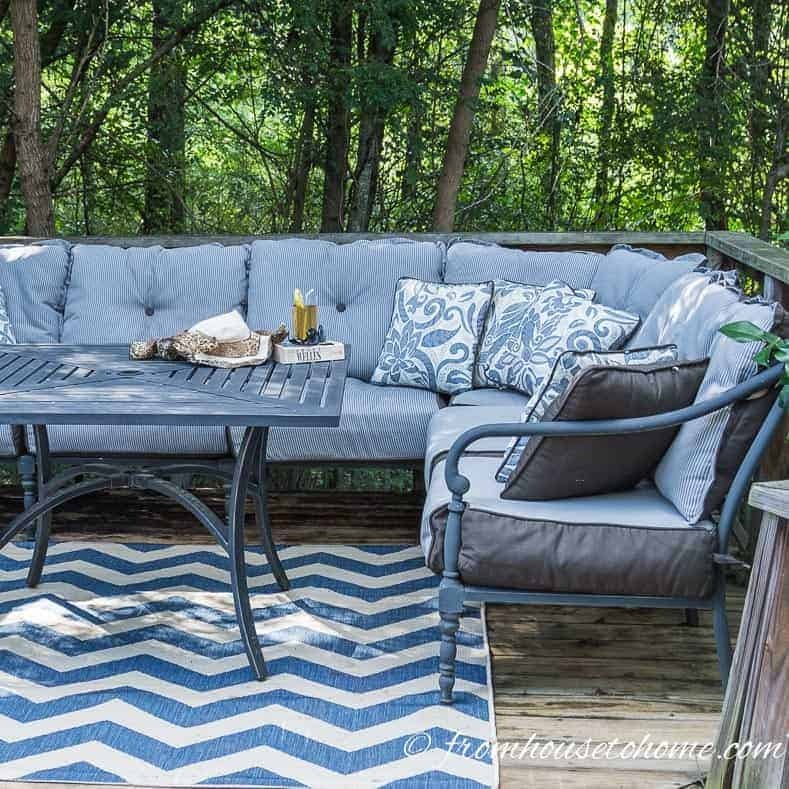 The outdoor rug* under the table on my back deck really helps to define the space and makes it feel like a real outdoor room. Adding a solar-powered lighted umbrella* even makes this deck useful after dark. 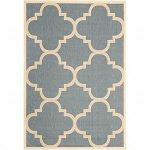 I actually added another similar outdoor rug* on my patio, too (which is a larger space) and the rug definitely pulls the whole look together. 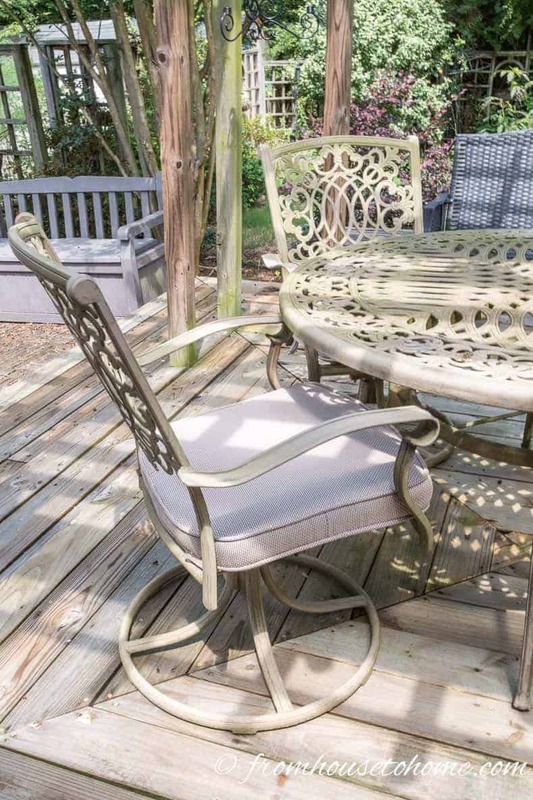 The main problem with small patios and decks is that there is no room to spare. Seating that has to be pulled out (like dining chairs) requires extra space that you may not have. 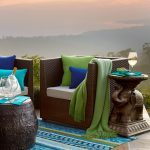 That’s why my third outdoor decorating idea is to substitute a sofa and a couple of arm chairs for a standard outdoor dining table and chairs. 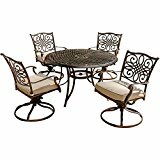 Having said that, if you do want to have a dining table and chairs on your small deck, there is a way to maximize the space. 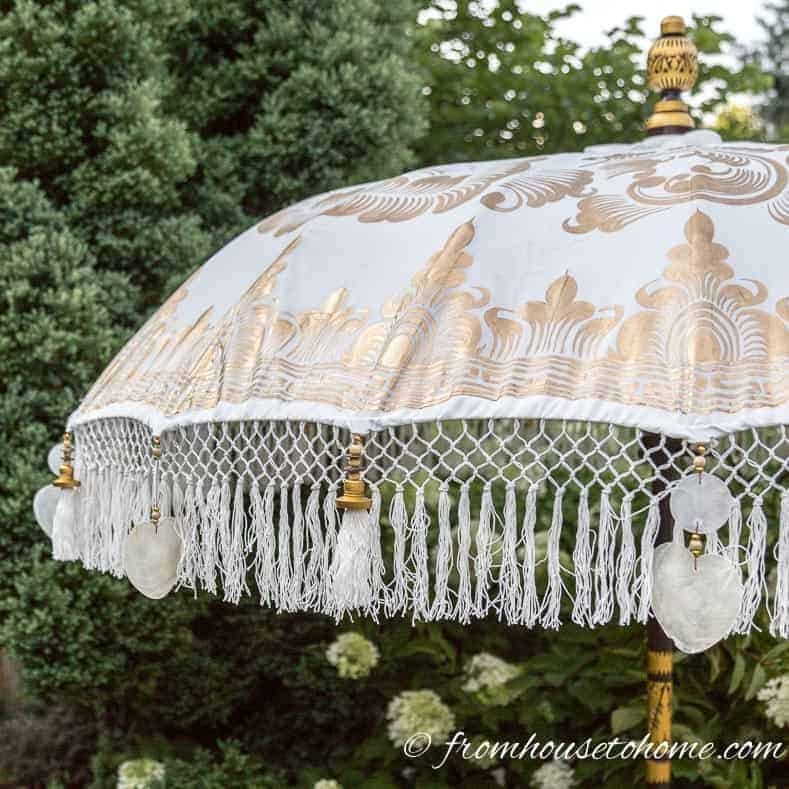 When I had my dining table in the gazebo, I was always afraid that people were going to push their chair out and fall off the edge. Then I turned the chairs on the diagonal…problem solved! It also helps to have a round table…no sharp corners to bump into. 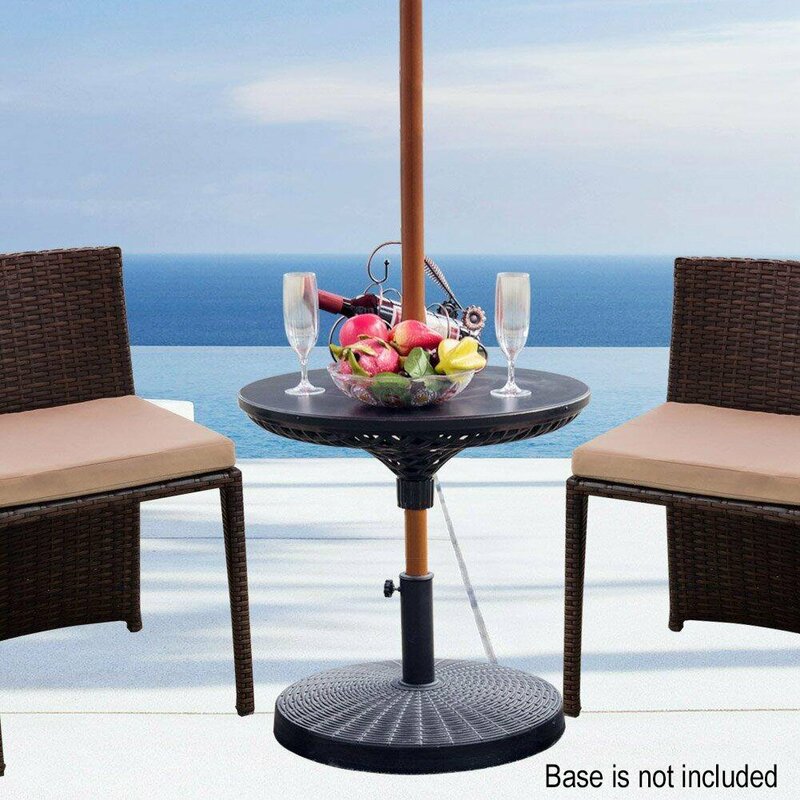 And on most small patios, a 48″ table is a bit too big to fit comfortably. 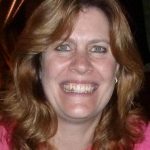 Try to find one that is a maximum of 42″ wide for the most placement flexibility. 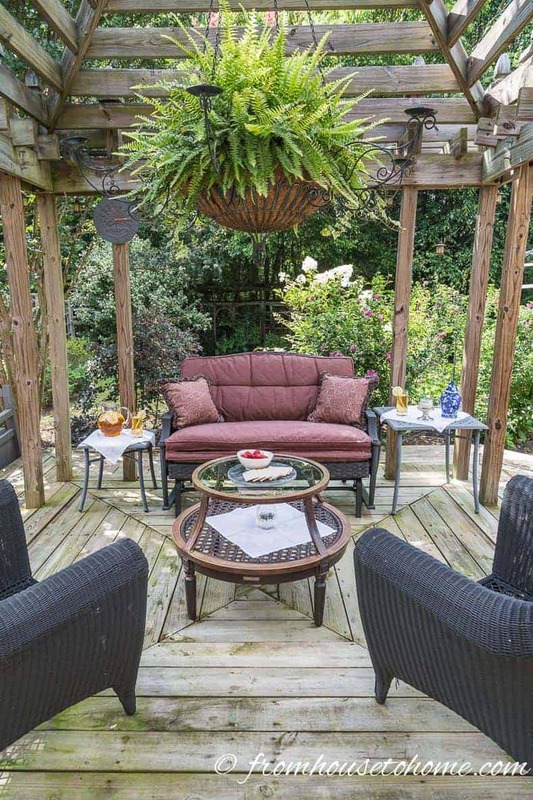 Just like when you’re decorating a small room, using multi-purpose furniture makes the best use of your small deck or patio. I love the idea of having a cooler that is so close by and doesn’t take up any extra floor space like these tables with ice coolers built in. 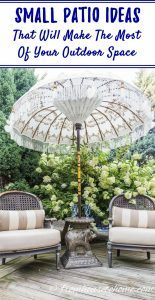 I haven’t incorporated this into my outdoor entertaining space yet, but it’s on my to-do list! Look for ones that have a cover for the opening so that you can also use the whole top as a table. 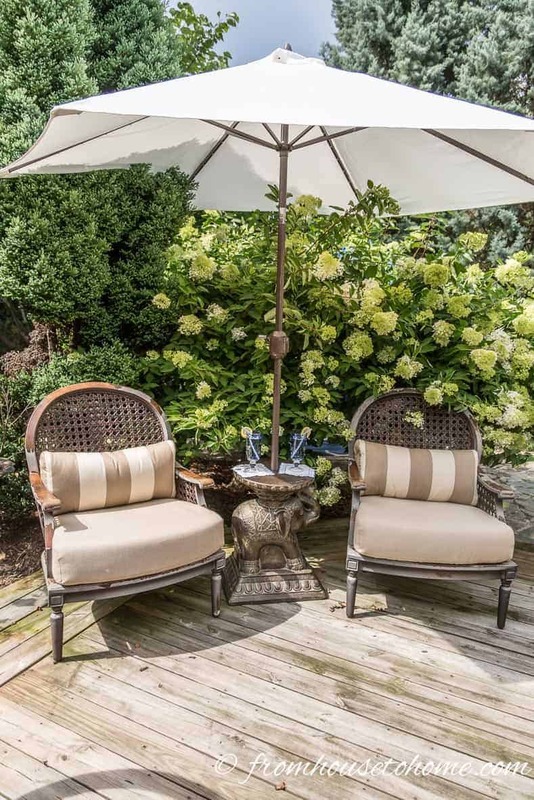 Number 6 on my outdoor decorating ideas list is another type of dual-purpose furniture that works well for small patios. 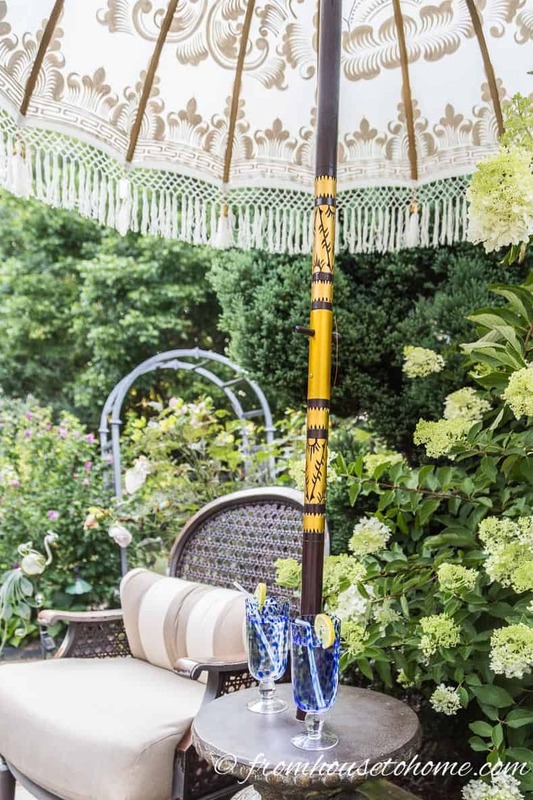 If you need some protection from the sun, a side table that also acts as an umbrella stand may be just the thing! 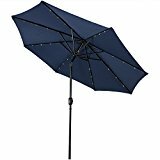 Or if you already have an umbrella stand, this table that goes around the umbrella pole* is a perfect way to make it more functional. 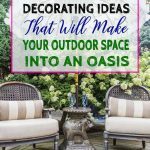 Another of my small patio decorating ideas is to add a focal point that takes your attention off the size of the space. 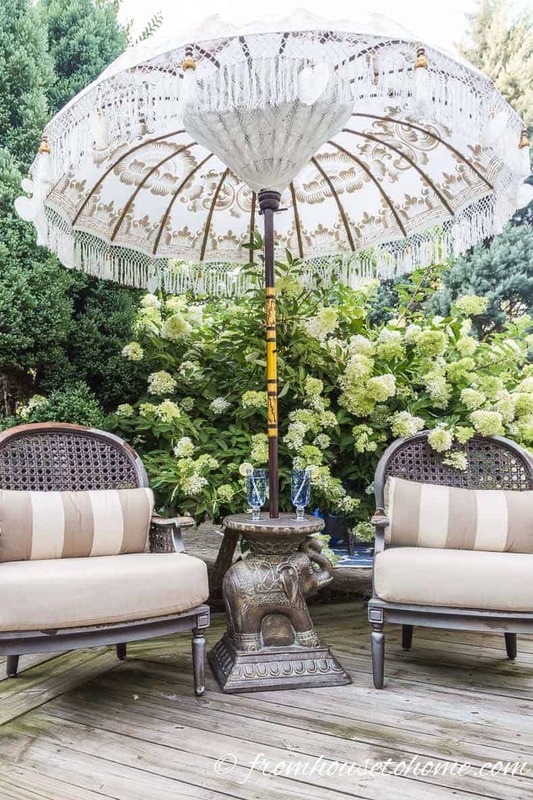 If you really want to make a focal point out of your seating arrangement, try adding a really pretty umbrella* like this one. 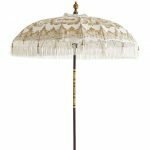 I have to confess that it is definitely the most expensive umbrella I have ever bought, but I think it was worth the splurge! 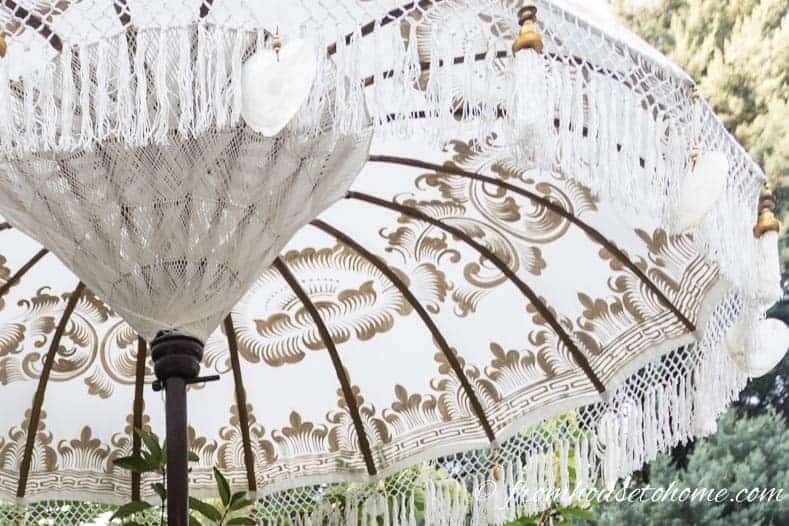 The view from underneath (where you’re sitting) is equally pretty. Even the pole is decorated with gold to make it less of an eye sore. 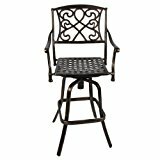 Instead of putting a standard height side table between chairs on your small deck or patio, try using a taller table instead. That way it can be pulled out to be used as a dining table when necessary. 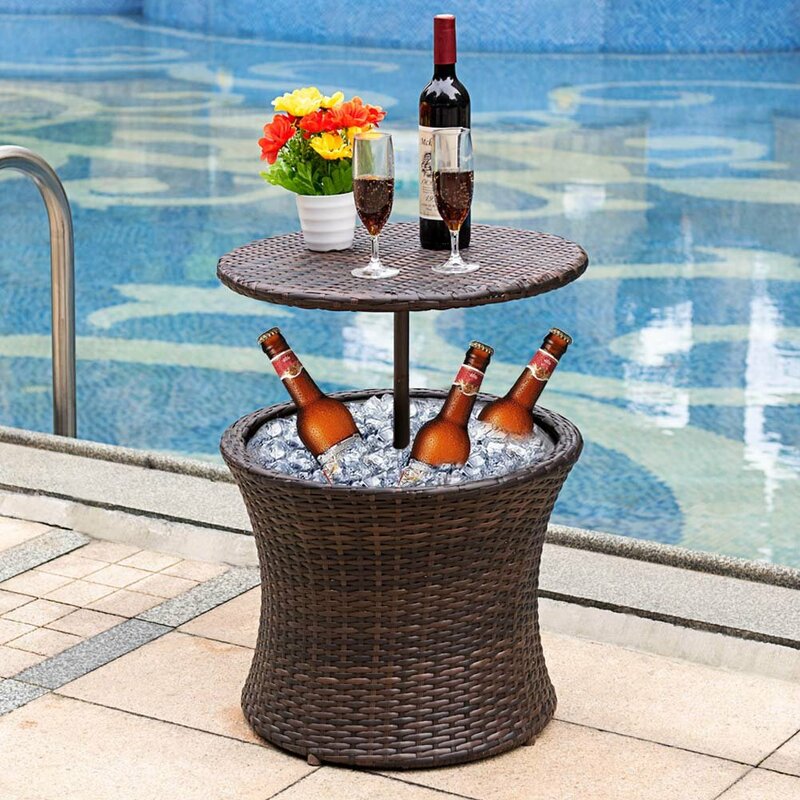 And pushed back out of the way when all you need is a table to put your drinks on. 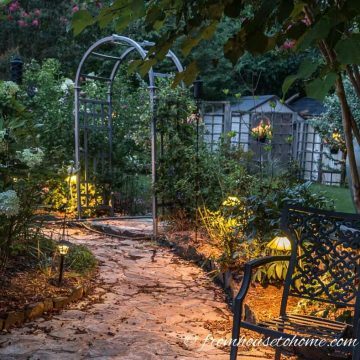 Surrounding a small patio or deck with plants makes the space feel very intimate and romantic…like you are hidden away in your own secret garden. 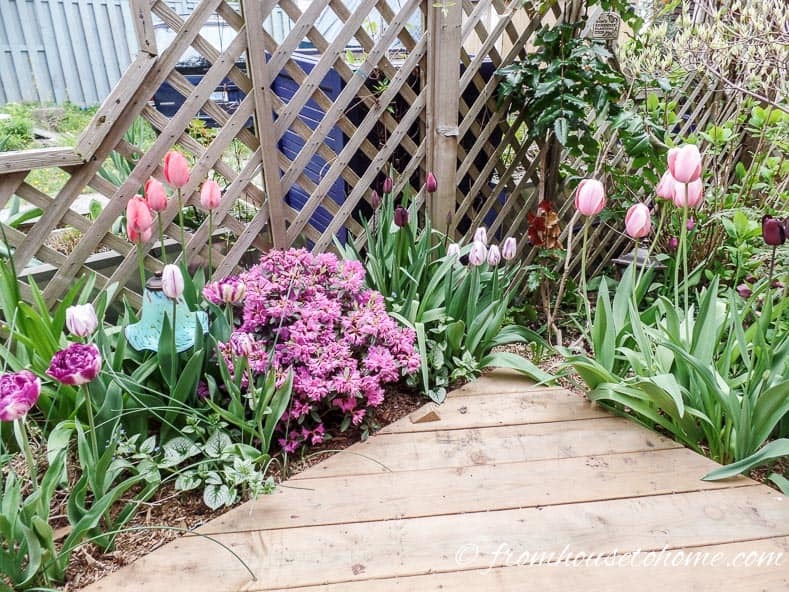 If you have a patio or very low deck, you can plan a garden bed that provides the plant backdrop and blurs the edges of the deck (like my mother’s deck shown here). Another easy way to do this is to build planters around the edge of the deck. Not only are the plants easy to tend to and water, but it also acts as a barrier that prevents anyone from falling off the edge. 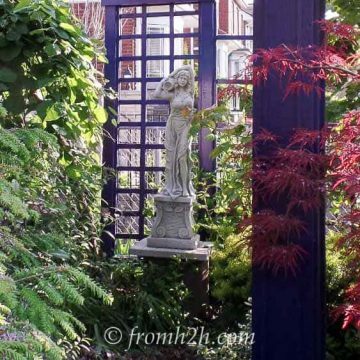 Building a screen around the deck can make it feel like a secret garden. 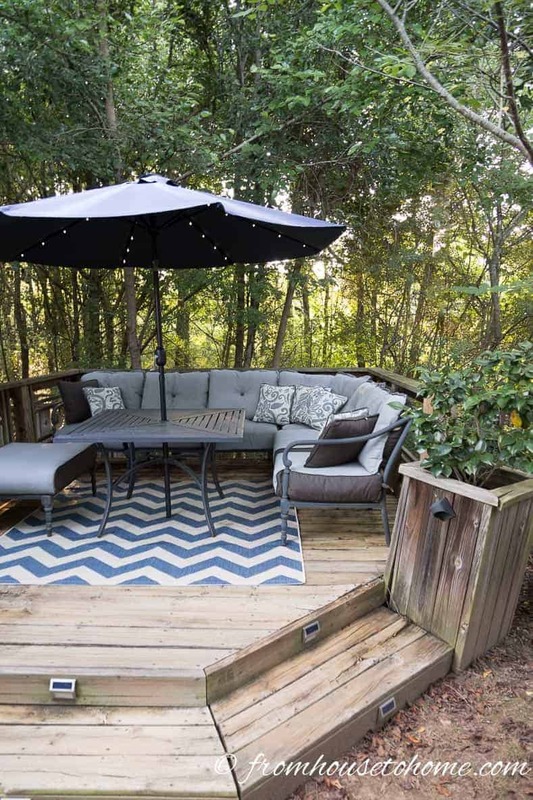 Putting up a screen around part of the deck can also be very effective for creating that sense of privacy. 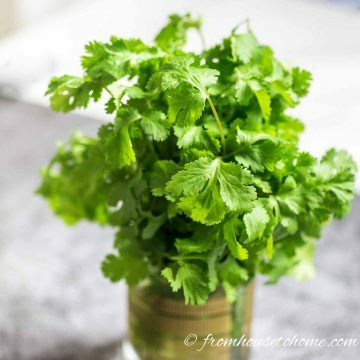 This works well even if you live on a city lot where your neighbors aren’t very far away. 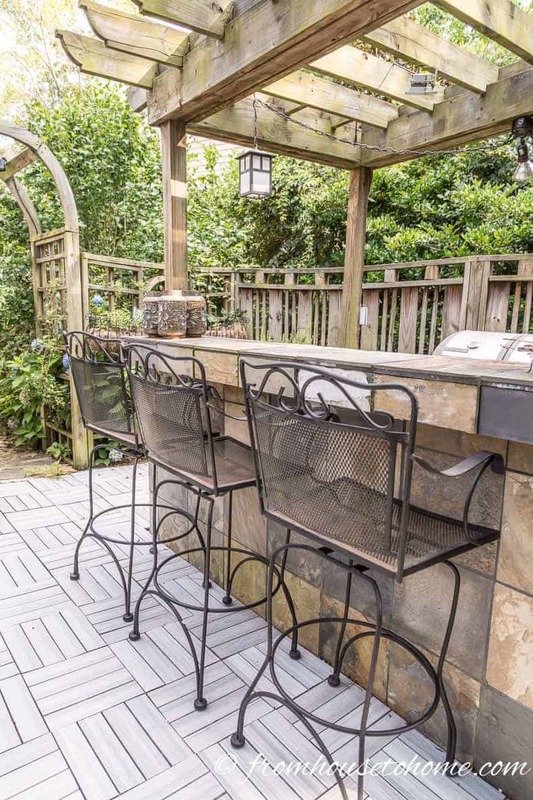 An outdoor bar is a great way to provide seating that doesn’t take up much room on a small patio. And it’s also a great place to entertain. I installed deck tiles around mine…it is a really fast and easy way to make a patio if you don’t have one already. 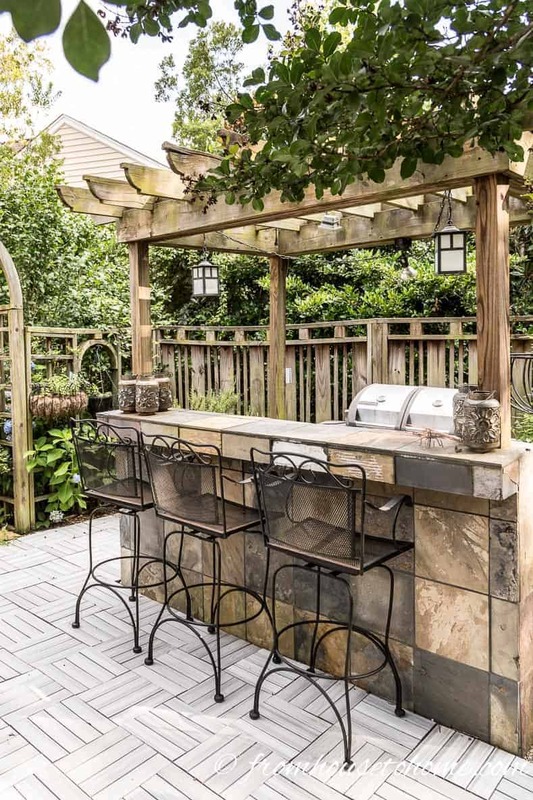 When I have outdoor parties, this outdoor bar and grill area is the first place that everyone heads to. 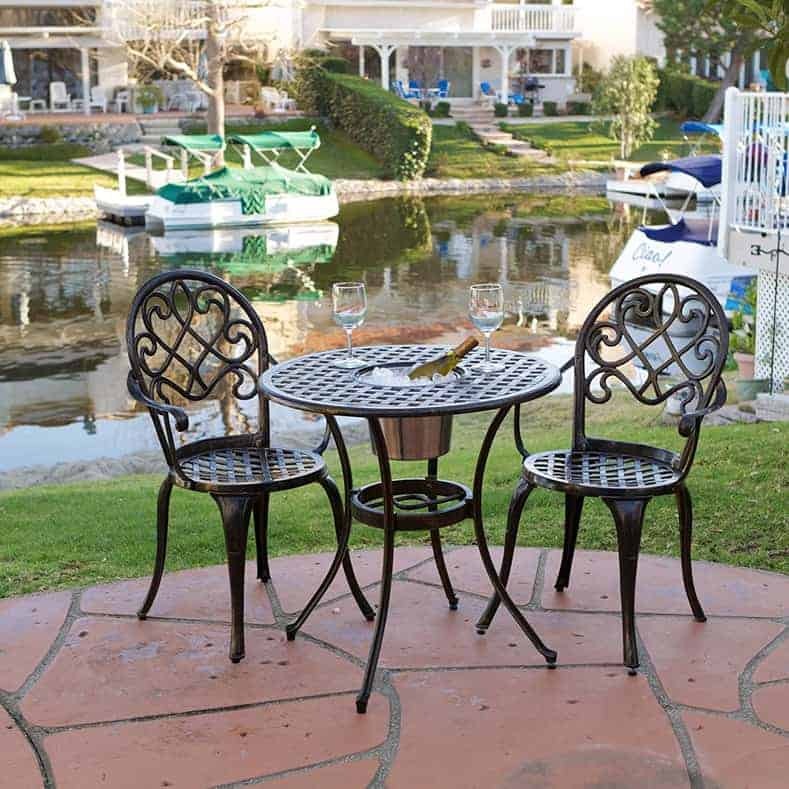 The tall bar stools* are everyone’s favorite seats, and they don’t take up a lot of room. Installing a mini fridge and the grill behind the bar works perfectly since I have space to cook while still being a part of the action. 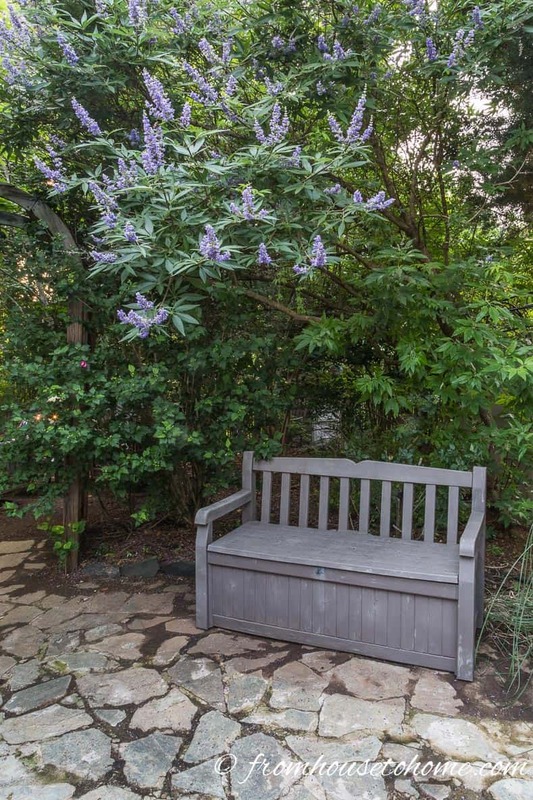 Benches provide a lot of seating in a small amount of space which makes them one of my favorite space saving small patio decorating ideas. 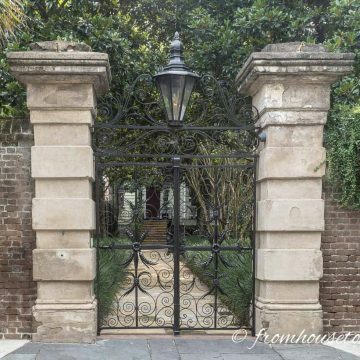 Because of their narrow width you can even fit them in on the edge of a pathway. This bench also stores cushions* which makes it the perfect multi-functional piece of furniture for a small area. 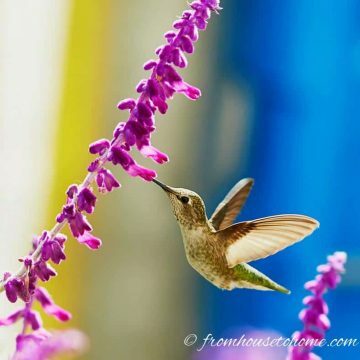 Well, that’s my tour of the garden rooms in my yard. 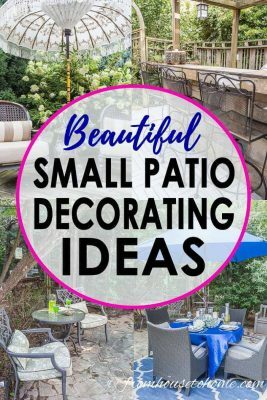 Hopefully you can use some of these small patio decorating ideas to make the most of the space you have, too. 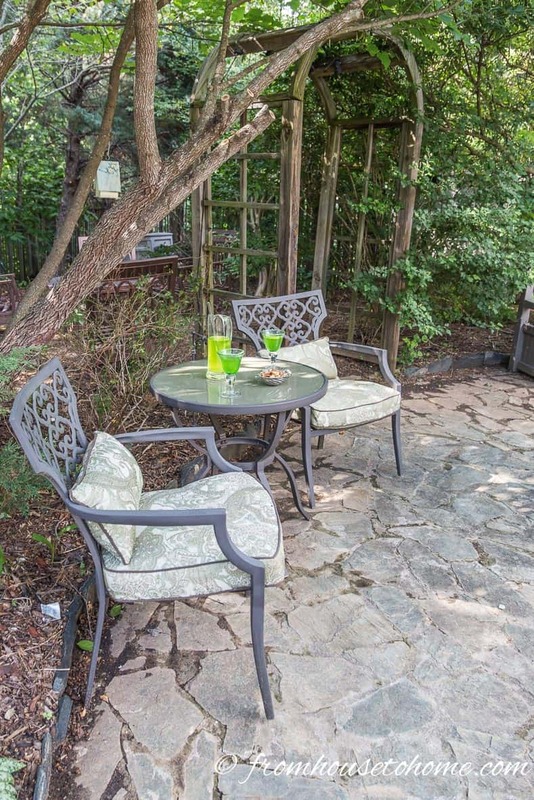 Comments or questions about our small patio decorating ideas? Tell us in the section below. Previous PostRhododendron Problems: What’s Wrong With My Rhododendron? Your garden room ideas are wonderful. Is it possible to do a panoranic vedeo to show how each space flows to the next?